We often operate under the illusion that we are fully independent, that we can do whatever we want whenever we want, that we don’t need help from anyone higher than ourselves. Why are these conceptions illusory? Because we are largely controlled by our body and mind, or more precisely by our psychophysical nature that arises from our body-mind machine. We frequently feel pulled in unhealthy directions by our desires, our habits, our addictions. 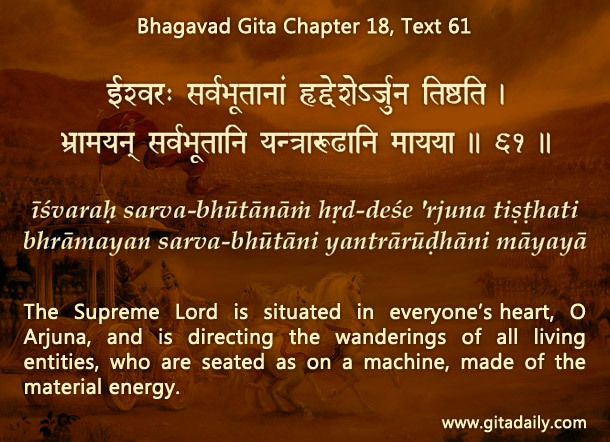 The Bhagavad-gita explains that beyond our body-mind machine, we exist as transcendental souls, who are parts of the supreme spiritual reality, Krishna. It (18.59) urges us to stay conscious of Krishna, lest we be overcome by our nature. Stressing that we are bound to act according to our nature (18.60), it points us towards the indwelling supreme, who is the lord of material nature (18.61). Instead of working for or against our nature, if we work with our nature to surrender to Krishna, we attain inner serenity and outer prosperity (18.62). However, if we are not humble enough to surrender to the Almighty, then we are humbled, even humiliated, by our mind and senses, which become almighty. They drag us here, there, everywhere, from one sense object to another, from one situation to another, from one material body to another – lifetime after lifetime, ad infinitum. The illusion of independence keeps us bound. When guided by Gita wisdom, we humbly accept the fact that we will always be controlled – if not by Krishna, then by his illusory energy. When we willingly submit to Krishna’s control by practicing bhakti-yoga, we access higher intelligence. By that inner insight, we can evaluate the various pushings of our nature objectively. And by devotional strength, we can let go of those pushings that are destructive and go along with those that are constructive towards destination Krishna. What is the belief that we are fully independent illusory? What happens if we don’t surrender to the Almighty? How does submitting to Krishna’s control help us?